California (#5877) (1848-1895), 199-foot passenger steamer built in New York by William Webb at a cost of $200,082. California was launched on May 19, 1848 and had a capacity of 210 passengers—60 salon passengers and 150 in steerage. She was the first of three Pacific Mail steamers to depart for the newly acquired Pacific Coast of the United States. On October 6, 1848, almost empty for lack of business, the California cleared New York. By the time she reached Panama, news of the discovery of gold in California had reached Panama, and the vessel “was greeted by a mob of gold-seekers, mostly Americans, demanding passage north.” February 28, 1849 she was the first steamship to arrive in San Francisco Bay, followed by the Oregon and Panama. Some three years later, on April 24, 1852 off Santa Cruz Island while enroute from Panama to San Francisco, and crowded with 500 passengers, the California had a complete breakdown of her machinery, thus she entered San Pedro under sail for repairs. The California was soon dwarfed by much larger ships built to carry passengers to the gold fields. In 1856 she was out to use as a spare steamer. California made voyages between San Francisco and Panama in 1860, 1861 and 1866. 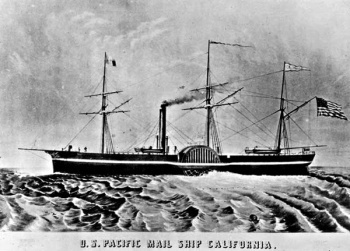 The vessel was sold to the California, Oregon and Mexico Steamship Company, but returned to ownership of the Pacific Mail Company in 1872. In 1874 she was sold to Goodall, Nelson and Perkins, who operated her in loacal coastwise service from San Francisco until the end of 1875, when her engines were removed and her hull sold to N. Bichard. Rigged as a bark, she was engaged in the coal and lumber trade until she was wrecked near Pacasmaya, Peru in 1895. This page was last edited on 6 July 2015, at 15:06.